I write to you today, not only as the Chairman of SolarWindow Technologies, but also as a fellow shareholder and a long-term supporter. As a private owner of commercial real estate in the United States and Canada, I know first-hand the impact that electricity-generating windows could have, especially those that could cut electricity cost by up to 50%, according to our independently-validated engineering modeling. Less than 4 months ago, my family office invested almost $25 million into SolarWindow, allowing the company to move forward on its long-held commitment of introducing a brand-new form of electrification – the SolarWindow™ – and turning entire buildings into vertical power generators. Only weeks ago, we hired additional key team members and retained advisors to grow our production team, and are adding even more by year-end. We’re driving our production plans, hard. Stay tuned as we announce even more important steps that push our manufacturing of SolarWindow™ electricity-generating glass products at commercial scale. With ample funds on hand and plenty of opportunity before us, these are certainly exciting times for all our valued shareholders and all of us here at SolarWindow. Without a doubt, we have set ambitious goals. I am sure we will have to deal with and overcome our fair share of challenges typical of any enterprise striving as we are. You can read about these potential risks in our various regulatory filings. These risks and challenges aside, the economic, environmental, and humanitarian benefits of electricity-generating windows are just too compelling pass up. This is why I have invested so much of my own personal money into SolarWindow, as have many of you, my fellow stockholders, who also believe in the future of our promising technology. According to the U.S. Department of Energy, energy from the sun is so plentiful that every week it produces 1,000 times the energy that oil, natural gas and coal does in a full year—combined. Our energy needs can in fact be easily met with just 1/10,000th of the estimated 173,000 terawatts of solar energy that strikes the Earth continuously. The SolarWindow™ was conceived to efficiently harness a fraction of this endless amount of free energy. The idea of creating an electricity-generating window took 10 years of hard, dedicated and focused work to overcome many early challenges and disappointments. 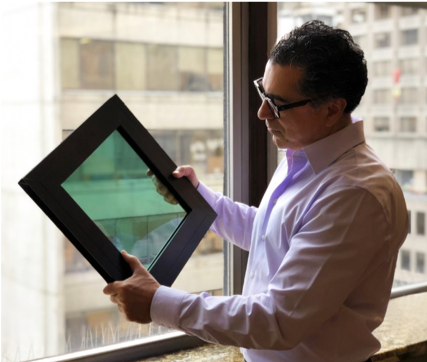 Your continued confidence in us has motivated us to accomplish what was to many seemingly impossible: turning an ordinary piece of glass into an electricity-generating window. Bolstered by the patient support of our shareholders and the resolve of our technology teams, we have shattered long-held scientific myths and filed more than 90 U.S. and international patents and trademarks. What started out as just a concept is now on in its way to becoming an industry-disrupting technology. Along with many first-ever breakthroughs and discoveries by John Conklin, our President & CEO, and our collaborating team of engineers and scientists, SolarWindow has won awards, presented to members of Congress and covered by many in the media, including by CNBC, the Wall Street Journal, Engineering.com, Fast Company, Voice of America, Scientific American, National Geographic and CCTV (https://www.solarwindow.com/2017/06/watch-technology-cctv/). The concept of electricity-generating windows is so exciting that whenever I meet with fellow building owners or real estate developers and talk about how entire buildings could become vertical power generators, I see expressions of excitement, enthusiasm, and jubilation. It’s amazing to watch their faces as they start learning about our plans for retrofitting existing buildings and how easily the energy can be directed into the electrical systems. When I mention a 1-year modeled financial payback for commercial buildings, their eyes light up and you can almost feel their hearts beat faster as they start talking about how to apply this technology to their existing and upcoming projects. According to independently-validated engineering estimates, a single SolarWindow™ installation on a 50-story building, for example, could reduce electricity costs by as much as 50% per year, avoiding the equivalent amount of carbon dioxide produced by 2.2 million vehicles each year. This is one of the main reasons why SolarWindow is initially targeting the estimated 5.6 million commercial buildings in the U.S. market, which alone consume almost $150 billion in electricity annually. Imagine this electricity bill cut in half. Frankly, I can’t think of any commercial landlord, being one myself, not wanting electricity-generating windows, which I personally believe could be transformational, not only for building owners and the energy industry, but also for the environment. We believe that our SolarWindow™ products are part of the solution, and we find tremendous energy in the opportunities and challenges that lie ahead. We also recognize that the introduction and mass adoption of electricity-generating windows will be no small or easy task. I fully expect us to make mistakes along the way because our ambitions are, well, ambitious! We are comforted by the strength of our almost 15,000 shareholders and a growing number of industry glass professionals, building owners and developers; and we look forward to sharing updates and news with all our supporters as we continue to make progress. If you’re not on our email list to receive late-breaking news and updates, please sign up by either clicking here (https://www.solarwindow.com/join-our-email-list) or calling my office directly at 800-213-0689. Of course, you can also follow us on Twitter @solartechwindow, Facebook or LinkedIn. Finally, and on behalf of the entire team at SolarWindow, I would like to personally thank you for your continued support and belief in our mission to turn entire buildings into vertical power generators with our brand-new form of electrification — the SolarWindow™. For additional information, please call Harmel S. Rayat at 800-213-0689 or visit: https://www.solarwindow.com/. To receive future press releases via email, please visit: https://www.solarwindow.com/join-our-email-list/. Follow us on Twitter @solartechwindow , or follow us on Facebook.